I am so excited for this life change we have had by living on the farm!! 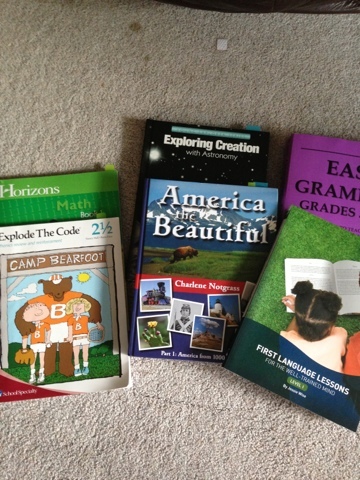 (Kids not quite so much, still having trouble figuring out how to fill their time out in the country!) But I truly have no idea what I’m doing! 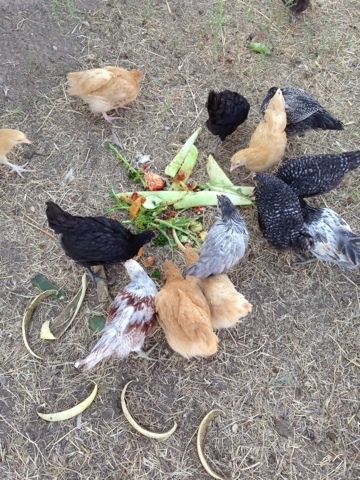 For the last few years, I have been following several blogs and reading books on raising chickens, bees, gardening, canning…. all things I have never done! Trying to get an idea of things I want to do on my own land. 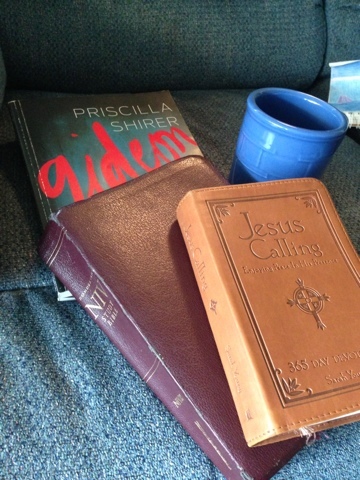 One of my favorites is a blog called The Prairie Homestead. It follows a woman who has moved with her family to a farm and they raise goats, a milk cow, chickens, have a huge garden…. the whole farm experience. What I like about her is that she breaks things down for the uneducated like me. 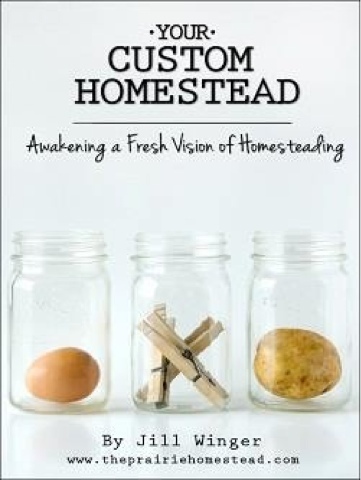 I purchased this ebook from her site – Your Custom Homestead. Emphasis on the word “custom” – you could be living in an apartment, subdivision, or a full on farm and you could still learn from it. She breaks down the book into 21 chapters – one chapter a day for three weeks and you will be well on your way to your custom homestead. LOVE it!!!!! I have spent hours organizing my thoughts on why I want to have a farm, what my goals are, what my goals are for this year, next five years, and next ten years, and how to organize all my thoughts into an organized form. For the newbie that I am, it has helped me so very much! It will help provide direction so I am not heading into this venture all willy-nilly! I am supposed to come up with 10 year goals but that is inconceivable to me right now!!! I have never in my life lived somewhere more than three years. That will take some hard thinking!!! What to do with trash? Reduce, reuse, recycle has not always been my motto. Early in our marriage, if something broke, I’d just throw it out. We had plenty of money to buy a new one! Why act like we couldn’t afford a new one!?!?! My husband was raised on a farm and this was not HIS motto! He would tinker with it and repair it, make it last longer. He didn’t believe in throwing anything away. “We just might need it!” I thought he was just being cheap, not seeing the wisdom in his thoughts. But slowly God began working on me. Can’t say what the catalyst was that truly changed me but I do know that in Genesis 2, God put Adam and Eve here on earth to take care of the land and animals who inhabit it. Shouldn’t I be taking care of the earth too? So, the last few years, I have been concerned about our trash use. Trying to recycle as much as we could. In Texas, our recycle cart was full each week while our trash cart had only one or two bags. Living in a big city, it was SO easy to recycle!!! They recycled everything! Glass, paper, plastics, cans…. and I had no worries about it. 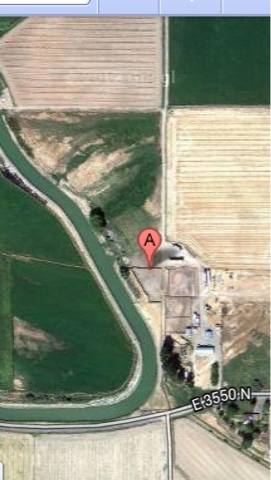 Now we are far from town AND our nearest big town isn’t big enough to support a complete recycling center. I am looking at everything in a new light. 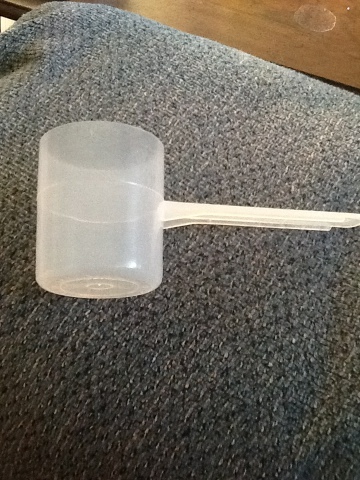 This is the scoop from a food container. Each thing I empty, I am thinking, “What can I use this for?” It took me a day but now this is the mealworm scoop for my chicken treats!!! Working with my inlaws these last couple of weeks has shown me the benefits of keeping everything! 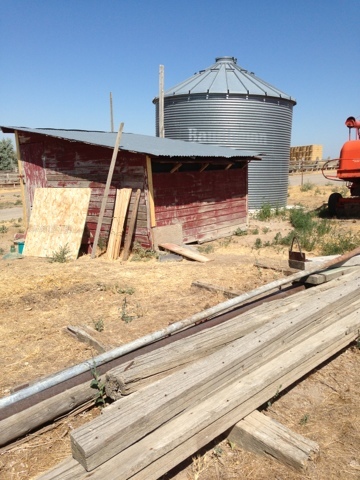 As we worked on the chicken coop, they were able to pull out all kinds of things to put it together – things that I previously would have thought was trash. Now I am looking at everything through a new light! I feel like I am becoming a true weirdo! 🙂 But I just want to take care of the earth God has given us! As I have said before, D’s family all lives around where we will be living. They all have their “own pieces of earth.” (From a favorite childhood book – The Secret Garden) So they will continue to be hounded by me as I am learning all I can! 🙂 D’s aunt is the only one who has chickens at this time. 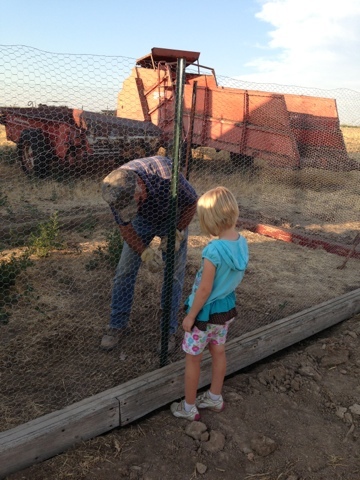 I asked her where she got hers and they are from a poultry hatchery near Boise who ships day old chicks. But the minimum order of birds to ship is 25. And the last hatch date of the year would be a month before we arrived. What was I to do?? I wanted chickens!!! 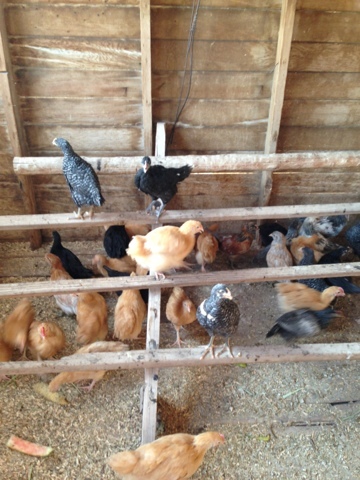 I asked my mother in law if she would be willing to watch/take care of these chicks for a month before we moved up there and she replied, “I was just thinking we needed chickens!” She requested Buff Orpinton chicks for herself and I ordered Barred Rock, Black Australorps, and Araucanas (since they lay green eggs!) for myself. I placed my order for 27 since we wanted a couple of roosters too. My in-laws received the call from the post office two days before estimated delivery date and they picked the box up. 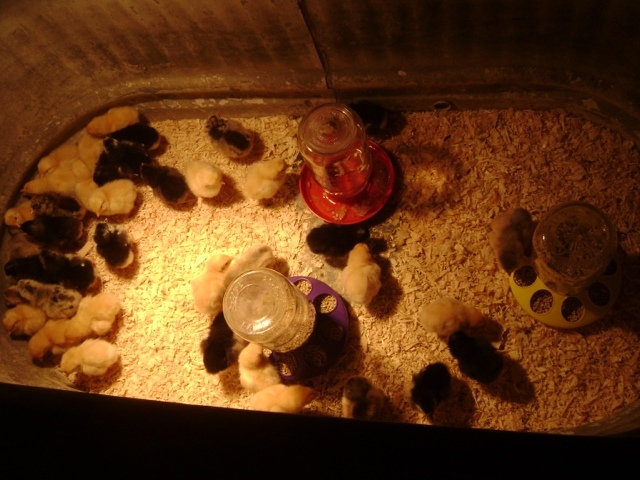 When they got home and put them under the heat lamp, they called to say, “We think we got more than 27!” But they couldn’t really count since the chicks were moving so fast! They kept them in the garage in a horse trough with a heat lamp on them for 2 weeks. 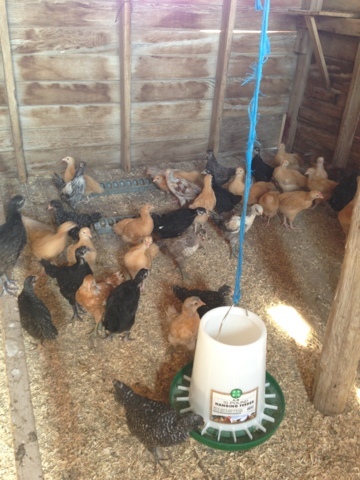 When the chicks started to fly out of the trough, they moved them to the 100 year old chicken house in the barnyard. As my mother in law placed them in the house, she was able to count each one. How many did we have?? FORTY-TWO!!!!! I ordered and paid for only 27! Guess the hatchery thought, “Here is a clueless person! Let’s send her all the extras! !” Now we are waiting to see how many will be roosters and how many will be hens! My first time to see my babies!! I am Angela and I have been married to my husband for 18 years. My husband, D, just retired from the US Navy after serving as an officer for over 20 years. We have travelled the world (D more than I) and lived all over the United States – from Hawaii to New York to Florida to Texas and states in between. My father was also in the Navy so I have literally moved all over the country all of my life. I have my favorite places to live and my NOT favorite places to live!